The movement of people from small towns and villages of India to places outside the country raises a number of questions– about the networks that enable their mobility, the aspirations that motivate them, what they give back to their home regions, and how their provincial home worlds engage with and absorb the consequent transnational flows of money, ideas, influence and care. This book analyzes the social consequences of the transmission of migrant resources to provincial places in India. Bringing together case studies from four regions, it demonstrates that these flows are very diverse, are inflected by regional histories of mobility and development, and may reinforce local power structures or instigate social change in unexpected ways. The chapters collected in this volume examine conflicts over migrant-funded education or rural development projects, how migrants from Dalit, Muslim and other marginalized groups use their new wealth to promote social progress or equality in their home regions, and why migrants invest in property in provincial India or return regularly to their ancestral homes to revitalize ritual traditions. These studies also demonstrate that diaspora philanthropy is routed largely through social networks based on caste, community or kinship ties, thereby extending them spatially, and illustrate how migrant efforts to ‘develop’ their home regions may become entangled in local politics or influence state policies. This collection of eight original ethnographic field studies develops new theoretical insights into the diverse outcomes of international migration and the influences of regional diasporas within India. These collected studies illustrate the various ways in which migrants remain socially, economical and politically influential in their home regions. 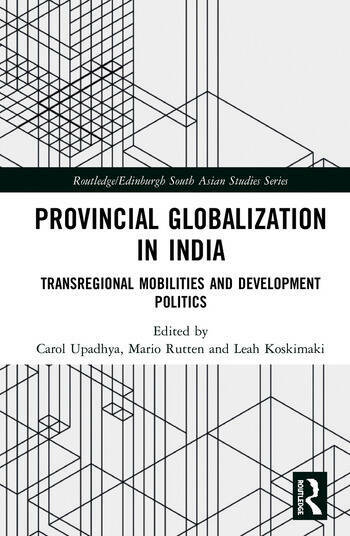 The book develops a fresh perspective on the connections between transnational migration and processes of development, revealing how provincial India has become deeply globalized. It will be of interest to academics and students in the fields of anthropology, geography, transnational and diaspora studies, and South Asian studies. Carol Upadhya is Professor in the School of Social Sciences at the National Institute of Advanced Studies (NIAS), Bengalura, India, where she directs the Urban and Mobility Studies Programme. She is the author of Reengineering India: Work, Capital, and Class in an Offshore Economy (2016). Mario Rutten (late) was Professor of Comparative Anthropology and Sociology of Asia at the University of Amsterdam, The Netherlands. He was the author of Asian Capitalists in the European Mirror (1994), Farms and Factories (1995), Rural Capitalists in Asia (Routledge Curzon, 2003), and ‘You had a Nice Holiday? : Stories about Anthropological Fieldwork (in Dutch, 2007). Leah Koskimaki is a sociocultural anthropologist and Postdoctoral Research Fellow at the Institute for Poverty, Land and Agrarian Studies (PLAAS) at the University of the Western Cape in Cape Town, South Africa. Previously she conducted research with the Provincial Globalisation Programme at the National Institute of Advanced Studies (NIAS) in Bengalura, India.